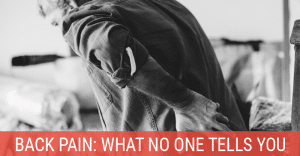 You’d think that spending your time sitting at a desk might seem like a better option than a job with physical labor, but for back pain sufferers, sitting for extended periods is not only painful, it can actually make your situation worse over time. 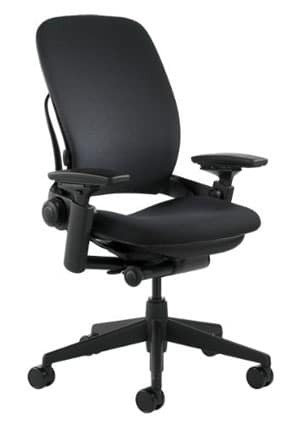 A good ergonomic chair is a necessity for those who are in front of a computer for multiple hours at a time. Choosing the best office chair for lower back pain doesn’t have to be a hassle, however. These three products are considered the creme of the crop, each containing a number of features designed to provide maximum comfort and support. All three of these contain features which are vital to any office chair for bad back, post-surgery, and maternity use. The most obvious of these features is lumbar support, which helps to maintain posture and spinal alignment in the lower back. They also have an ergonomic design, which simply means they are designed to conform to the body to provide optimal comfort and support while simultaneously helping to reduce pain. Finally, these chairs are all adjustable to support individuals of varying height or weight. If more cushioning or height is needed, you can easily add an inexpensive back support cushion for even more comfort. After the success of the Equa chair, the people at Herman Miller wanted to push the envelope of design and create something unique and revolutionary. The result is the Aeron Chair, which resembles the child of a desk chair and lawn chair. This unusual look contributes to its function and helps make it one of the most well-known office chairs for back pain. The design of this chair involved professionals in the fields of ergonomics, physical therapy, and orthopedics; and detailed measurements were taken of 224 individuals, as well as pressure mapping, thermal testing, and heat/moisture dissipation levels to ensure the chair would have the best possible fit. The result is a cushion-less, curvilinear (using curves for a more natural look and feel) design which provides both ventilation and a less intrusive appearance. The Pellicle suspension system remains exposed and the chair’s overall design is curvilinear, meaning the entire structure . The Aeron Chair is designed to respond to changes in your position. The patented Pellicle material supports your weight and doesn’t have the same heat and moisture problems of more conventional office chairs. The exposed design of the chair makes it easy to replace damaged parts. These parts are also made of largely recycled materials and are themselves recyclable. Add to that a 12-year factory warranty on all of its parts, and you have a chair which is easy on your back and will outlast most competitors. You can even select from one of three available sizes to fit your individual weight and height for maximum comfort. There are a few issues consumers have had with the Aeron Chair, which tend to fall into three common complaints. The first and most frequent problem has been with quality control. Like any product that becomes popular, copycats eventually start popping up trying to pass off cheap imitations as the genuine product. To avoid receiving an inferior product, be sure to buy this chair only from an authorized dealer. Secondly, while the chair is comfortable, it does not provide the same experience as memory foam (as on the Steelcase below) for those 8-10 hour sittings. This has proven to be a negative factor for some buyers. Finally, while the chair is designed for support, some people believe the upper back support is not as effective as the lower and mid-back support it provides. Known best for their mattresses, Serta is a company devoted to providing comfort. 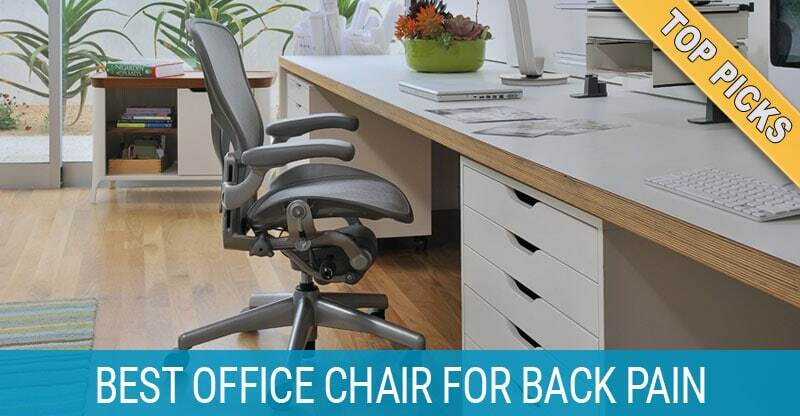 Their 44186 Back in Motion Health and Wellness Mid-Back Office Chair may have a long name, but it is also a top choice for chronic back pain sufferers. As the least expensive office chair we recommend, it’s still a night and day difference over the average office chair you’d find at Office Depot or Staples at the same price point. The lumbar support design pivots forward with you to always keep your lower back properly aligned as you move. It may not have the crazy amount of adjustments as the Herman Miller or Steelcase chairs, but it provides just as much comfort to those with chronic back pain as the more expensive models. You almost feel like you’re lounging in a recliner. While most users love the overall padding, some would prefer for there to bit a bit more cushioning for prolonged use. Also, shorter users may not find The Serta chair is easy to assemble and the adjustability includes everything from height and recline position to armrest height. Going for a more traditional look, the Leap chair by Steelcase is full of unexpected features and is a favorite with many larger companies who have done their research on ergonomics. 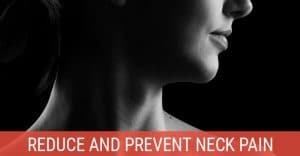 The back is designed to change its shape, providing better support for your spine as you work no matter if it’s for a few minutes or 8-10 hours. As you recline, the seat slides forward, allowing you to sit in a variety of positions. This feature is very similar to what the Serta above offers and for lower back pain, it’s a good one. While the design may look a bit too vanilla for some, it’s quite comfortable and it has a large number of settings to adjust. There are a lot of adjustment options, which may be a little frustrating or even overwhelming until you find the best settings. However, users generally agree that it is well worth the effort once you find that settings sweet spot. The only common complaint with the Leap chair is that taller individuals (6′ 3″ or more) may find the seat height simply doesn’t go high enough for them. That said, for average height users, the Steelcase Leap is a comfortable, highly adjustable, and well-built office chair. 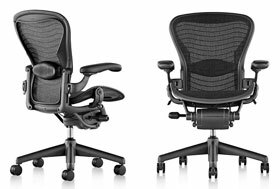 Herman Miller provides additional information about the Aeron Chair, its development, and its features, on their website. Steelcase offers a wide variety of options which are described on the Leap chair’s page. Just replaced my old worn out chair with the Steelcase Leap chair. I got a special edition model with a silver color backrest. There’s really a lot of adjustments with this chair. However, one thing that this chair lacks is the forward tilt, which is used when you want to do some close-up work on your desk. The seat depth is adjustable to compensate for the length of your legs. 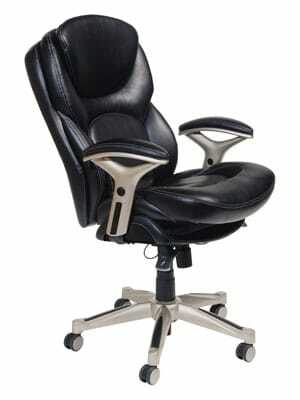 It also has a good lumbar support, which can be adjusted up and down with the knobs located on each side of the backrest. Overall the chair is quite comfortable to sit in and I am happy with my purchase. 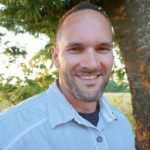 Adam, great post for lowering back pain, I usually take a short break of 15-20 seconds to blink my eyes continuously after working 2-3 hours straight. 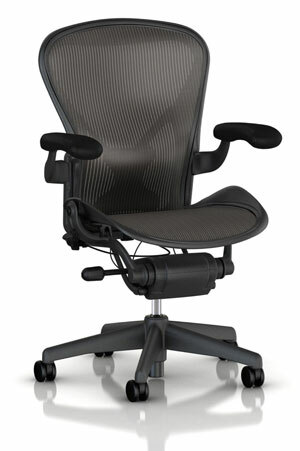 I don’t think the Aeron Chair by Herman Miller chair is a good idea for lower back pain suffers. I have a mesh chair very similar to it. Can’t use it anymore. If you look at the seat, you’ll see it’s curved and creates an angle that is considerably less than 90* to the back of the chair. This is very similar to leaning forward in a chair, which will cause any bulges or herniations in the back of the disk to bulge out and cause pain. A chair that is 90* is much better. I sit in a hard chair that is exactly 90* and no less. Huge difference ! Totally understand where you’re coming from. I remember first trying the Aeron a good 5-7 years ago because everyone was talking about it. I absolutely hated it and was convinced people were just buying it for the styling. Just like you said, it felt like the back was almost tilting you forward. 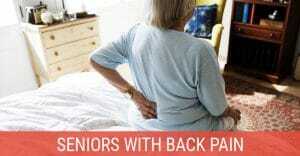 Anyone with lower back pain will tell you that’s one of the worst positions to be in. Fast forward to last year where I started a new job and at my desk was a new Aeron. I’ll just say that the redesign of the chair that Herman Miller made in 2016 took care of the issue and sitting in the chair for 8+ hours a day was better than any other chair I tried during that time. I ended up buying a Steelcase Leap for home at a deal I couldn’t pass up. Great chair, but the Aeron felt a bit better at my height. The Steelcase would have been perfect if my legs were a couple inches shorter. As always, your mileage may vary and a chair that’s super comfy for most people might be awful for someone else.